You can customize the menu bar clock that appears in the upper right corner of your Mac to include more than just the current time, and one of the more useful things to add is the current date. 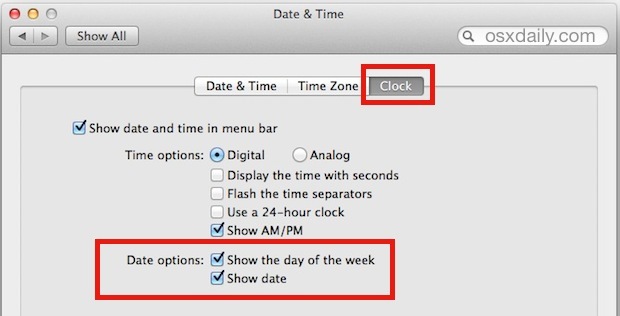 This is particularly helpful in OS X because unless you have the Calendar app open all the time, you have to actually click on the clock to pull down into the menu to see the date and day of the week on Mac. As you can see, the date appears alongside the clock, but the actual day of the week name is shortened by default to better fit within the Mac menu bar. The year also does not appear by default. If you feel like it, you can change that (and other options like adding emoji to stylize the clock a bit) by visiting the “Language & Region” preference panel and poking around in the Advanced options. Another option is to install a third party app like Day-O, which puts a full Calendar into the menu bar of OS X, a feature which is so useful that frankly, it should be built into the Mac menu bar by default. Depending on what version of OS X you are running, the exact parameters might be a little different but it’s the same concept. In fact, prior versions of OS X doesn’t put the option in the Date & Time prefs at all. Instead, really old versions need to launch the System Preferences, and then visit the “International” preference pane, followed by the ‘Formats’ tab… next click the “Customize” button in the Times pane. Similarly, to show the Date in the active format, extract the Date info from the International -> Formats -> Dates pane. Here you can alter the appearance of the Time format, add the date (in a format you specify), or add a custom message. The “International” formats also allows for some further customization to the menu bar clock item though by choosing the customize button. You can either paste in the items you want to show, or you can even add in static text if you want to, like “OSXDAILY Rules!” or something to that effect. The end result can really be anything you want. Thanks for the tip idea Steve! It does not work. I have a MacBook with OS X 10.4.8 and I followed the instructions actually as specified and I still have the regular clock info. I do not recommend this “trick” at all because this will affect the date format for files in Finder. You have to set the values you want to see in International -> Formats -> Times section (not the dates section) -> Show:Medium. Only medium will affect the display. Also, this has no effect on the date format for files in Finder. Two more things. Copy and paste values from the Date section into the Times section. If the day of the week shows up, turn it off in the Date & Time preference. It’s interesting how many people never actually customize their OS X menubar clock. When I configure new systems, I always setup the clock to show the date, and the time with seconds. I especially setup servers to show the time ticking so that I can know quickly if my remote desktop connection is lagging. That’s a great trick! Do you just watch to see if the clocks stop syncing to look for lag? Or do you always expect some lag with the time ticking on the remote server? month and day are shown in the calendar icon without open calendar Application. The Date on the Menu Bar will only show the in the US format of Day of the Week, Month, Day. Most of the World uses Day Month Year. It would be nice if Apple did some work on this and catered for the millions of non-US users. This is easy to fix (and has been part of Apple since way before OS X). Change your Region to match your location – for example change it to United Kingdom and the clock now shows Wed 25 Jun. It will give you examples of the time and date formats for your region below when you select your new Region. Interestingly enough, I found this using the Help menu. I was using my Win7 desktop for a bit today and instinctively clicked on my clock for a calendar to check what day a date landed on. Got to thinking, I wish my Mac’s clock did this. Ten seconds with Google later, Day-O is now my clock and my computer is now one more task more efficient for me. I recommend Acalendar (https://itunes.apple.com/us/app/acalendar/id538592555?mt=12) it has a nice design and you can customize the menu date format. Thanks so much! I am a Windows person and have all the tricks and shortcuts down, but my brother in law bought me a macbook pro. I haven’t had the time to do tutuorials so i am still struggling to see advantages of mac over windows. So thanks for this which i missed from windows!